The Callaway Golfit Sport Band combines elite, on course GPS performance with a sleek, stylish fitness band. On the Course, get elite GPS performance with distances to the front, center, and back of the green and a digital scorecard to track your score. Away from the course, our fitness component tracks your heart rate, step, and your sleeping pattern to help you live a healthier life! 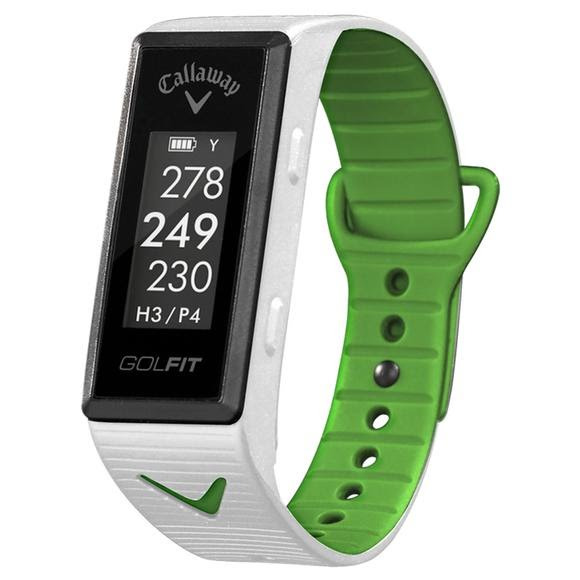 The Callaway Golfit Sport Band combines elite, on course GPS performance with a sleek, stylish fitness band. On the Course, get elite GPS performance with distances to the front, center, and back of the green and a digital scorecard to track your score. Away from the course, our fitness component tracks your heart rate, step, and your sleeping pattern to help you live a healthier life! Bluetooth capability allows you to save your golf scores and your fitness stats to our free app on our phone as well as receive call, text, and email notifications right to your wrist!